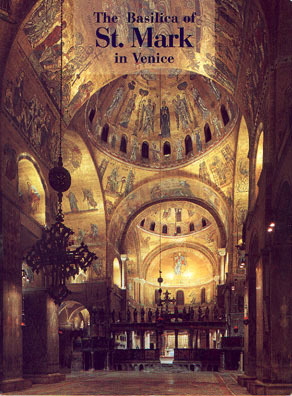 174 pages, paperback, 8-1/4 x 11"
The church that the Venetians built to house the body of St. Mark, taken by them from Alexandria, is famous the world over. They spared no expense, and employed the most skilled artisans, to create a monument to their faith in their patron saint and to their commercial and artistic glory. Mosaics, marbles, pavements, sculptures, icons and decorations are unrivalled in their sumptuousness and as examples of Byzantine art at its apex. With an enormous number of high-quality color photographs, including many details and many full-page illustrations, this book provides complete documentation of the history and decorative program of the Basilica. It will appeal to those who are interested in Venice, in Byzantine art, in mosaics, pavements, the decorative arts, and Church history.